St. Louis Blues: Time to Panic? After a long offseason of exciting moves and building expectations, the St. Louis Blues have had an inauspicious start to the season to say the least. Allowing eleven goals across back-to-back losses, the Blues already have their fans in fits over what may become of this young season. 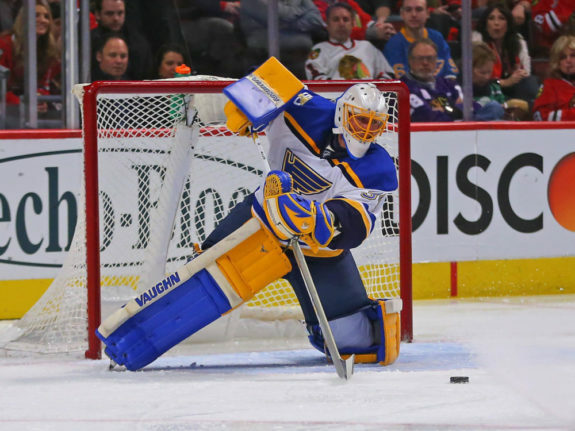 Particularly troublesome is the apparent inconsistency of the team’s defense, as well as the questionable play of the team’s goaltender, Jake Allen, who was often labeled as St. Louis’ biggest weakness heading into the season. Allen has saved just 81.8% of shots on goal against him in the first two games, hardly a comforting answer to the questions asked of him this summer. But what is the correct response to these two losses? Should fans take a breath and realize the season is young? Or is it time for all-out panic? Let’s take a look at some warning signs and some positive developments for the team so far. We might as well address the obvious issue first: Jake Allen has done nothing yet to reassure fans that tend to distrust him. While it may be fair to suggest that these losses aren’t primarily Allen’s responsibility, he also did nothing to bolster a struggling defense and makeup for their mistakes. When the team collapsed in game one, allowing three goals in less than two minutes, Allen was unable to make a save that bailed out his team, and a few minutes later, he allowed a fifth goal that was absolutely unacceptable for a professional goaltender. Most of the goals in the second game were the result of defensive lapses, but again, Allen did not bail out his defense at any point. When Jonathan Toews broke away for what would become the overtime winner, many fans stood up from their seats before he crossed center ice. There is simply no confidence in Jake Allen right now, whatever other players might suggest. Good goalies make all the saves they’re supposed to make. Great goalies make saves they aren’t expected to make, the kind of saves that turn games around for their team. Right now, Jake Allen is doing neither. While it’s early in the season, the team’s play in net is an immediate concern for the team to address if they intend to contend this season. The Blues have long been known as one of the league’s more stalwart defensive teams, certainly since Ken Hitchcock took over the team in 2011. But early in the 2018-19 season, they have been anything but reliable on the blue line. This may be more circumstantial, though. Robert Bortuzzo missed game one of the season on a suspension. Joel Edmundson has been battling a nagging injury, but hopes to return to face Calgary on Thursday. Carl Gunnarsson is still on injured reserve and will be until at least November. 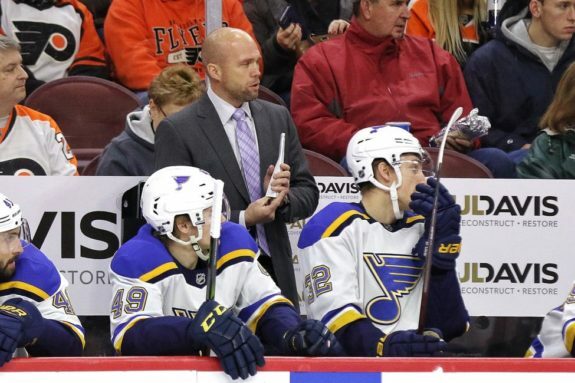 With these injuries, the Blues have been forced to turn to Chris Butler, who is primarily an AHL player at this juncture in his career, youngsters like Jordan Schmaltz, and have relied on Jay Bouwmeester in a top line capacity. Still, there are some concerns beyond injury. Captain Alex Pietrangelo looked especially poor in game two against Chicago. On two separate occasions, he failed to box out Toews while he collected a rebound and scored. 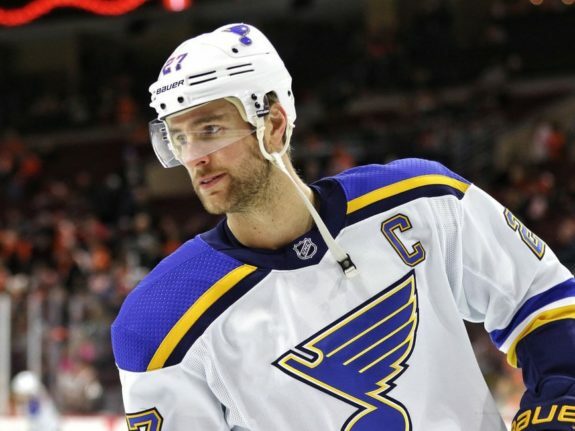 No one should worry about Pietrangelo, of course, as he’s one of the league’s best all-around defenders, but his struggles aren’t making up for the failings of his teammates. Edmundson’s return should immediately help the entire defensive core, but they need to set things straight soon. The combined struggles of the defense and the goaltending have left the team in shambles, creating deficits that even a revamped offense cannot overcome. But all is not bad on the shores of the Mississippi. The Blues have plenty of positive things to take away from the young season. Here are just a few. The Blues surprised many when their opening night roster included a bevy of young players earning day one opportunities with the NHL club. Among these players were their top two forward prospects, Jordan Kyrou and Robert Thomas, each of whom has looked good at different periods in the first two games. Kyrou in particular earned a big opportunity, playing on the second pairing with Brayden Schenn and Jaden Schwartz. Despite being the youngest and newest player on that line, he could be seen driving the play on several different rushes. Thomas, for his part, though being deployed in a fourth line role, has regularly shown the responsibility and heads-up playmaking skills that make him such a valuable prospect. For these players to continue to succeed, they’ll need the backing of their head coach, something that has not historically been a strong suit of Mike Yeo’s. And troubling trends have already emerged, with Thomas’ minutes being severely limited in the second game, despite playing well in the time he was allowed. But the young guns didn’t stumble into the season, and that’s reason for hope. These are the players that could take the Blues’ roster to the next level, as long as they are given the opportunity. Despite doubling his 2017-18 penalty minute total in one game on Thursday, the Blues’ biggest offseason acquisition Ryan O’Reilly has looked phenomenal through two games. The league’s best face-off man has continued that streak, winning 87% of his draws so far, and he’s added four points, too. There was reason to hope that O’Reilly might take his already stellar game to another level when paired with players like Vladimir Tarsenko, and so far it looks like that may be happening. No one expects him to finish the season with 164 assists, but he’s already set a tone for his Blues tenure, particularly by supporting the power play, where he’s assisted on both of the Blues’ goals this week. O’Reilly takes the Blues’ forward group to a new level and will continue to be a key cog in their offense. The biggest reason for hope, of course, is that the season is still young. With the amount of turnover St. Louis experienced in the summer, it was always likely that they’d take some time to gel as a unit. Yes, the first two games went poorly, more poorly than anyone could have expected, but they still escaped with a point despite two embarrassing losses. Questions remain to be answered, questions that could define the season. Is Jake Allen capable of carrying this team through a season? Do the Blues have enough depth on the blue line? 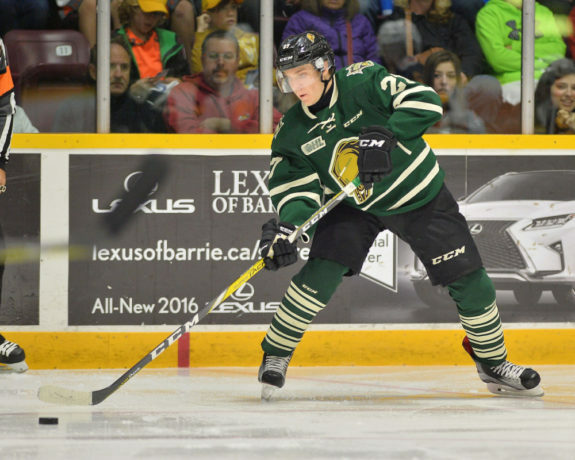 Is Mike Yeo going to manage this newly assembled roster well enough? We don’t know the answers to these questions yet. But there’s still plenty of time to answer them. So no, it’s not time to panic. Blues fans suffered pretty significant whiplash between the high expectations of the summer and the early disappointment of the season, but that’s not a reason to give up. It’s very likely that the Blues will be fine in the 2018-19 season. And judging by the offseason, general manager Doug Armstrong will be quick to make changes if they are not.